wait until Disney added flexible usage benefits. This is a cross-platform redesign for web, mobile web and app for both Disneyland and Disney World. I was 1 of the 4 interaction designers on this project. My contribution included concept exploration and iteration, prototype development and motion defining. Which concept best fits guests' mental model? 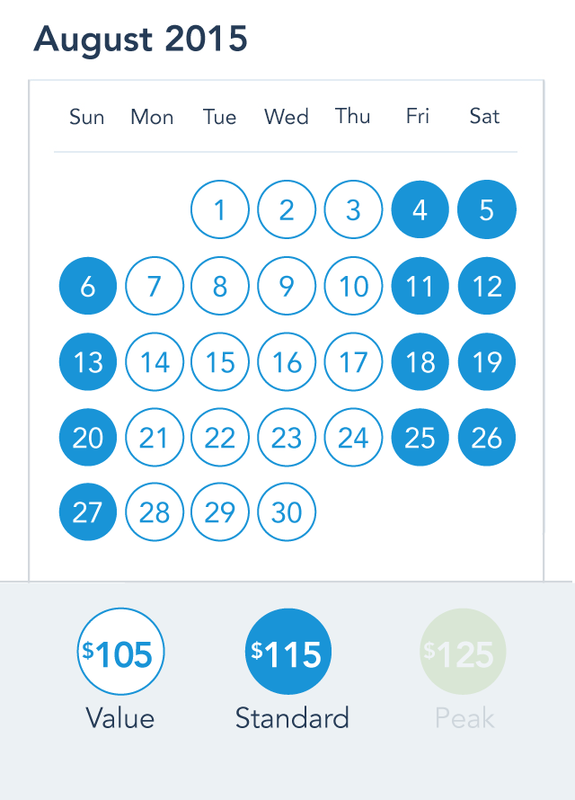 Seasonal priced ticket concept is quite unique in that there weren't any existing similar product for us to iterate design patterns from. Mental Model 2: "I want to purchase tickets that allow me to use on a range of dates"
Thus a 4th concept was added based on the findings as shown above. The concepts shown above are Axure prototypes we built. It was an interesting challenge to collaborate with the 2 other designers in a different office location. We managed to do it by creating dynamic reusable components and then each take on one of the 3 concepts to work on separately. While working on it, we kept an iterative mindset, utilizing global/local variables, conditions and customized action panels to create more dynamic prototypes so that later on it could be modified on the fly during the 3-day test sessions based on the feedbacks and design iterations. By the end of the two test sessions we eventually found out that valid dates info is secondary to the users. We thus detached it from the calendar interface and put it inside a slide up info layer through "About 1-Day tickets". We also mentioned it later in the flow on the confirmation screen as well. After settling down on the app design, we moved on to see what the web and mobile web experience would be like. But because there're added complexity for the 1-day seasonal tickets, this page structure doesn't work anymore. Inpired by Virgin America flight searching page, we designed this interaction model called progressive revealing.